Kerry says that the United States is ready to work with all parties to de-escalate tensions in the Ukraine crisis and renews his call for Russia to "send troops back to their barracks." "Ukraine's territorial integrity must be restored and must be respected," Kerry says. "From Lebanon to Ukraine, the US stands ready to help our friends in need." The European Union's Political and Security Committee (PSC) and NATO's North Atlantic Council (NAC) held a joint informal meeting today to discuss the situation in Ukraine, ahead of the meeting of EU heads of State or government tomorrow. The discussions underlined the seriousness of the crisis and showed the convergence of views in both organisations in upholding Ukrainian sovereignty and territorial integrity, the need for a dialogue between Ukraine and Russia as well as de-escalating steps in view of a peaceful solution to the crisis in full respect of international law as laid down in bi-and multilateral commitments. Ambassadors had an exchange of views on the various dimensions of the crisis in Ukraine and the options for the response of the International Community. The PSC and the NAC are the bodies respectively of the EU and NATO at ambassador level responsible for monitoring the international situation. PSC-NAC meetings are an integral part of the continuous political dialogue between the EU and NATO, including the so-called “Berlin Plus” arrangements and informal meetings. They formally meet on EUFOR Althea, the operation in Bosnia and Herzegovina making use of NATO common assets and capabilities. As the political crisis rages on in Ukraine and global leaders lock horns over how best to solve it, the U.S. men's national soccer team is playing Ukraine in an international friendly. Business Insider's Tony Manfred is live blogging the game, which, as of 2:18 p.m. ET, saw Ukraine take an early lead. Russian President Vladimir Putin and Germany's Chancellor Angela Merkel discussed possible international efforts to help improve the situation in Ukraine in a phone call, the Kremlin said in a statement on Wednesday. The West has threatened sanctions against Russia which effectively occupied Crimea after the ouster of President Viktor Yanukovich. Moscow accused the Western powers of supporting a "coup" to topple him and did not recognise the legitimacy of the new Ukrainian authorities. #UN obviously very keen to get Serry out of Crimea. On flight to Istanbul then back to Kiev. Russia's Lavrov did not meet with his Ukrainian counterpart at the Paris talks, Western diplomats said after the Russian foreign minister left, according to Reuters. However, Lavrov reportedly said he will continue discussion on Ukraine 'in days to come' to see how best to stabilize the country. A senior State Department official, denying an earlier Russian report, says no agreements were made at the Paris meeting between Secretary of State Kerry and Russian Foreign Minister Lavrov, according to Reuters. Russia's envoy to NATO accused the alliance of applying double standards and "Cold War" stereotypes to Russia after NATO announced a review of all cooperation with Moscow over tensions in Ukraine. "This meeting proved that NATO still has a double standard policy. And Cold War stereotypes are still applied towards Russia," Alexander Grushko told reporters after a meeting of NATO and Russian officials to discuss Ukraine on Wednesday. According to the Kremlin, Russia's Putin and Germany's Merkel discussed possible international efforts to improve the situation in Ukraine, Reuters reports. The foreign ministers of Ukraine, Russia, Britain and the United States arrived on Wednesday at the French foreign ministry, according to Reuters reporters on site. There was no word whether there would be direct talks between the Russian and Ukrainian ministers. U.S. Secretary of State John Kerry and British Foreign Secretary William Hague had said earlier that they would try to bring the Russian and Ukrainian ministers together. NATO announced a full review of its cooperation with Russia on Wednesday to try to pressure Moscow into backing down on Ukraine and said it would suspend planning for a joint mission linked to Syrian chemical weapons. NATO Secretary-General Anders Fogh Rasmussen said alliance officials would no longer hold staff-level meetings with their Russian counterparts, while stepping up engagement with Ukraine's civilian and military leadership. "We have also decided that no staff-level civilian or military meetings with Russia will take place for now," Rasmussen told reporters after a meeting between NATO and Russian officials in Brussels. NATO has been in talks with Russia on a possible joint mission to protect a U.S. ship that will destroy Syria's deadliest chemical weapons. The Russian ambassador to NATO says the alliance applies 'Cold War' standards toward Russia, Reuters reports. With diplomats from Russia, Ukraine, and the West meeting in Paris on Wednesday and European leaders set to convene for an extraordinary session in Brussels on Thursday, the crisis in the Crimean Peninsula seems to have taken a brief pause while Western leaders explore their options for staving off bloody war in Ukraine. Whether Russian President Vladimir Putin intended to leverage de-escalation in return for an autonomous Crimea all along, or because the West has issued harsher threats than anticipated, most analysts agree that Russia could be ready to back down. But with more than 6,000 troops stationed in Crimea and Putin reiterating as recently as Tuesday that military intervention is still on the table, the diplomatic road to de-escalation is delicate. There is wide consensus that by sending troops into Crimea, a Russian separatist flash point in newly West-facing Ukraine, Putin has more or less already made his point that Russia’s military might in its “near abroad,” the former Soviet republics, is uncontested. Further instigation — which could spark regional war — will yield diminishing returns and international condemnation. Since landing in Crimea on Friday, Russian forces have not advanced elsewhere into the Russian-speaking south and east of Ukraine — as many feared would happen — and what once seemed an imminent war sparked by Ukraine’s pro-European uprising has tapered slightly to a tense, but thus far bloodless standoff. Unwilling to send troops into Crimea, the U.S. and its cash-strapped, war-weary NATO allies have threatened a combination of vague economic sanctions and geopolitical exclusion they hope will be enough to stop Russia’s march further into Ukraine. Some analysts say those threats have begun to do the trick. We believe that the threats to Russia, which we have heard in public statements by the US Secretary of State, John Kerry, with regard to the latest events in Ukraine and Crimea, are unacceptable. Without taking the trouble to understand the complicated processes in the Ukrainian community, and assess the situation, which keeps deteriorating after the forceful seizure of power in Kiev by radical extremists, in an objective way, the Secretary of State is operating with “cold war” methods proposing to “punish” the Russian Federation, instead of those who were the builders of this coup d’état.At the same time, they maintain silence on the fact that the United States and their allies turned a blind eye on the atrocities of the militants in Maidan, their mistreating of political opponents and plain civilians, the violent Russophobia and anti-Semitism, the besmearing of the memory of the heroes of the Great Patriotic War. Washington has also ignored that the newly-created Kiev regime trampled on the agreement of the 21 February, which was signed by the German, French and Polish foreign ministers, and formed a “government of champions”, having actually announced a war against the Russian language and everything associated with Russia. Allies of the west have now turned into being open neo-Nazis, who destroy orthodox temples and synagogues. Russia’s position has always been and is, consistent and open. If Ukraine is just a territory for geopolitical games for individual western politicians, then for us it is a fraternal country, with which we have many ages of shared history. Russia is interested in a stable and powerful Ukraine, where the legal rights and interests of the Ukrainians, our compatriots and all nationals are enforced. Our measures are adequate and absolutely legitimate in the extraordinary conditions, which were not created by us, when the life and security of the residents of Crimea and the south-eastern regions are in real danger because of the irresponsible and provocative actions of Banderovites and other ultranationalist elements. We are for a faster return of the situation in Ukraine to normality, on the basis of the agreement of the 21 February, including the formation of a legitimate national unity government considering the interests of all political forces and regions of the country. GOP leadership aide clarifies that offsets won't be needed for Ukraine aid since bill authorizes use of existing funds. Russia accused Ukraine of "hallucinating" on Wednesday after Kiev warned a U.N. atomic agency meeting of risks to the safety of its nuclear power plants in case of a Russian invasion, diplomats said. Envoys of the two neighbours engaged in a fiery verbal exchange during a session of the 35-nation governing board of the International Atomic Energy Agency (IAEA), a U.N. body, diplomats who attended the closed-door discussions said. In the wider dispute, Russia rebuffed Western demands to withdraw forces in Ukraine's Crimea region to their bases amid a day of high-stakes diplomacy in Paris aimed at easing tensions over Ukraine and averting any war. At the IAEA meeting in Vienna, which also discussed Iran and other issues, Ukraine spoke of the security of its nuclear power plants, highlighting possible environmental consequences if they were caught up in a military conflict. Ukraine's envoy to the IAEA, Ihor Prokopchuk, said the "physical protection" of its 15 nuclear power reactors "can be endangered," according to one diplomat who was in the room. "Potential consequences of a military invasion would be a threat of radiation contamination on the territory of Ukraine and the territory of neighbouring states," Prokopchuk said. "In addition, a significant amount of the spent nuclear fuel, which is stored on the territory of the nuclear power plants, would pose potential high risks," he said. Russia's representative on the board, Grigory Berdennikov, reacted angrily, saying the remarks were "nothing but a provocation" and that Ukraine was conducting "malicious slander". Ukraine is "hallucinating about phantom dangers from outside," the diplomat quoted the Russian envoy as saying. Another diplomat confirmed the "hallucinating" quote. Neither Russian nor Ukrainian diplomats were immediately available for comment. In the same debate, the U.S. envoy to the IAEA said his country was "very much aware of the potential consequences should sabotage or an attack occur at a nuclear power plant". "We reiterate the importance that all member states in their actions contribute to a strong nuclear security environment worldwide and avoid actions to destabilise it," U.S. Ambassador Joseph Macmanus said, according to a copy of his speech. Ukraine's 15 nuclear power reactors accounted for nearly 44 percent of its electricity production in 2013. In a letter to IAEA Director General Yukiya Amano on Tuesday, Prokopchuk said Ukraine was reinforcing the protection of its nuclear plants because the Russian military posed "a grave threat to the security" of his country. On Sunday, Ukraine's parliament called for international monitors to help protect its nuclear power plants. According to Interfax, Russian Foreign Minister Lavrov said after meeting Kerry that Western partners agree the Ukrainian government and opposition need to stick to the Feb. 21 agreement, which was the European Union-brokered peace deal, Reuters reports. During a short presidential flight to Hartford, Conn., White House spokesman Jay Carney reiterated the United States is closely monitoring the situation in Ukraine, adding that the US has seen a broad validation for international support for the government of Ukraine and broad condemnation of Russia's actions, according to reports from the press pool aboard the flight. While Carney acknowledged the Ukrainian government needs to ensure the rights of ethnic Russians in the country are protected, there is no evidence those rights have been violated. Carney also reportedly stressed Russia has an 'easy way out,' meaning President Putin can bring UN or OSCE monitors to Crimea to independently assess the situation on the ground. The meeting between Secretary Kerry and Russia's Lavrov is ongoing, State Department spokeswoman Jen Psaki said at 12:47 p.m. ET. In an interview with Al Jazeera English's John Hendren, Ukrainian opposition leader Yulia Tymoshenko stressed the Kremlin has declared war not just on Ukraine and not just on Crimea but on the whole world. And while she does not believe Russian President Putin will stage a full-scale war, Tymoshenko called on the countries that signed the Budapest Memorandum to demonstrate force so the Kremlin will step back. Expanding on that, Tymoshenko said the source of the conflict is the presence of the Black Sea fleet and after the crisis has ended, Ukrainians must do everything possible to ensure the fleet leaves. Tymoshenko also likened the strife gripping Ukraine to the Cuban missile crisis, saying the countries involved need to take a step back and a strategy of containment should be used as much as possible. When asked if the current crisis grasping the country is partly her fault as well, Tymoshenko answered that all politicians should repent, adding that she does. However, she said, what's more important is that politicians change and be worthy of the people. Expanding on her political views, Tymoshenko said the upcoming elections will be the first independent ones in the country and for the first time, Ukrainians will be able to elect new leaders. However, she won't consider any political position until the crisis is over. 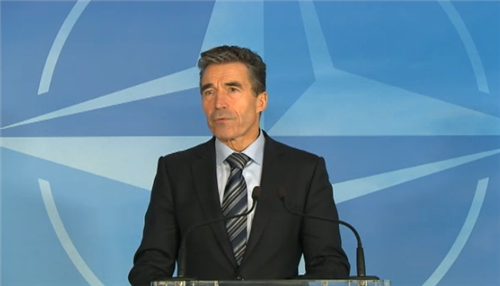 FYI: NATO Sec-Gen @AndersFoghR and the interim Ukrainian PM will be talking to the press around 10:15 EST. #OSCE in #Simferopol were confronted by granny rabble. But left safely by the back door. Ukraine's new prime minister, in his first interview since taking office, told The Associated Press that Crimea must remain part of Ukraine, but may be granted more local powers. Arseniy Yatsenyuk told the AP Wednesday that a special task force could be established "to consider what kind of additional autonomy the Crimean Republic could get." The prime minister, approved by parliament on Feb. 27, denied a report that Ukraine was negotiating with the United States for deployment of U.S. missile defenses in exchange for financial help. "This is not true," Yatsenyuk told the AP. "We have no talks with the government of the United States of America on any kind of deployment of any military forces." The Ukraine premier has told The Associated Press Crimea must remain in Ukraine, but it may get more autonomy, the news outlet reports. You wouldn’t catch Putin destabilizing the “brotherly peoples” of Ukraine with meddling like that. He hasn’t, according to him, even sent in any troops. The heavily armed men riding around in armored personnel carriers are just “local self-defense forces” with no connection to Russia, he said. Forget the Kalashnikovs and bazookas. 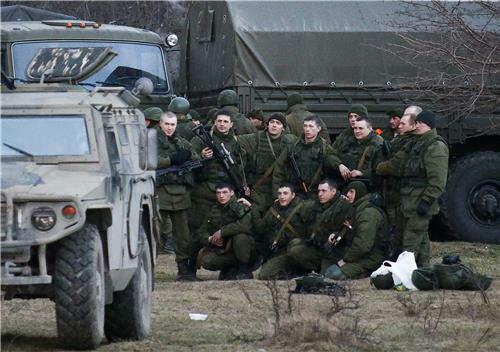 They’re not wearing Russian uniforms, are they? Just go to your local shop and see for yourself. “The post-Soviet space is full of such uniforms,” Putin told the journalists gathered to hear him speak. Hearing this stream of consciousness from Putin for more than an hour — during which he bantered on the definition of revolution with a Reuters reporter, complained about how a Ukrainian oligarch had “swindled” a Russian oligarch out of billions, and openly mused about the death of ousted president Viktor Yanukovych (who made a point of insisting he was very much alive during his last public appearance) — makes you feel a little bit sorry for his Western interlocutors, who put up with long telephone rants from him over the weekend. Angela Merkel apparently now thinks he was “in another world,” according to theNew York Times. His insistence that he would only invade Ukraine “in line with international law” and with (very lengthy) views on Ukrainian constitutional procedure didn’t appear to impress Barack Obama. “I know President Putin seems to have a different set of lawyers making a different set of interpretations,” the U.S. president said Tuesday, “but I don’t think that’s fooling anybody.” Secretary of State John Kerry, in Kiev Tuesday to pat the new government on the back and stick his tongue out at the Kremlin, scoffed at every word Putin said: “Not a single piece of creditable evidence supports any one of those claims,” Kerry said. To an extent, Putin’s opponents in the West are right. Putin is living in a world of his own making. Right now, it doesn’t sound like a nice place to be. He is disingenuous about the legitimacy of Ukraine’s new government. He is paranoid that U.S. secret services are wreaking havoc on his turf. His pretext for invasion, which mostly centers around a Gulf of Tonkin-style “attack” on Crimea for which no evidence (bar an obviously fake video) even exists, is risible. According to analysts who talked to The Associated Press, Russia is unlikely to pull back in Crimea. But even with tough economic penalties, some regional analysts say it may already be too late to reverse course in Crimea. "The idea that there's a contest over Crimea is a little silly," said Matthew Rojansky, a Russia analyst at the Wilson Center, a think tank in Washington. "It's in Russian hands and it was always on the verge of being in Russian hands." Rojansky said the most pressing concern for the U.S. is instead to keep Putin from pushing into Russian-friendly areas of eastern Ukraine, where U.S. officials are warily eyeing ethnic skirmishes. Putin on Tuesday said he saw no reason for Russia to intervene there at the moment but added that he reserved the right to take that step if Russian speakers in the region were in danger. The Crimean peninsula is separated from the rest of Ukraine by geography, history and politics. It only became part of Ukraine when Soviet leader Nikita Khrushchev gave the peninsula to his native land in 1954, a transfer that hardly mattered until the Soviet Union broke up in 1991 and Crimea ended up in an independent Ukraine. Crimea's port city of Sevastopol is also home to the Russian Black Sea Fleet and its thousands of naval personnel. Yanukovych, the ousted Ukrainian president, extended the fleet's lease until 2042, but Russia fears that Ukraine's temporary pro-Western government could evict it. The U.S. is not calling for a full Russian withdrawal from Crimea, the Obama administration official said, but does want Moscow's forces to return to their normal operating position at their base, where they have an agreement with Ukraine to keep up to 11,000 troops. The official wasn't authorized to discuss the situation by name and would speak only on condition of anonymity. The situation in Crimea has drawn comparisons to Abkhazia and South Ossetia, two breakaway territories of the former Soviet republic of Georgia. Russia has continued to maintain a military presence in both, violating a cease-fire that ended its 2008 military conflict with Georgia and ignoring repeated condemnations from the U.S. and Europe. Barry Pavel, who worked on the White House National Security Council under both Obama and President George W. Bush, said reasserting control of Crimea may be even more important to Russia than the Georgian territories. "Russian nationalists consider this to be practically Russian territory," said Pavel, who now serves as vice president of the Atlantic Council, a Washington-based think tank. "The chances of Russian forces ever leaving where they are are very low." The European Commission released a rather detailed press release outlining its support for Ukraine. Secretary of State Kerry said Wednesday that the United States and United Kingdom failed to bring Russia and Ukraine together for a meeting in Paris, Reuters reports. However, the UK's Hague said they will make every effort to bring the Russian and Ukrainian ministers together later in the day, according to Reuters. According to the European Union's Barroso, the European Union is ready to provide 11 billion euros of financial aid to Ukraine over the next couple of years, Reuters reports. In occupying Ukraine’s southernmost province, the Autonomous Republic of Crimea, Russian President Vladimir Putin has simultaneously invaded a neighboring country that poses no security threat to Russia, unilaterally declared that he has a carte blanche to invade any country with a Russian population and even invited rogue states to develop nuclear weapons. This new Putin Doctrine threatens to undermine the entire global order. His insistence that he is entitled to violate international law for the pursuit of his own ends is nothing less than a megalomaniacal claim that could, if implemented systematically, produce a world war. Putin justified his invasion of democratic Ukraine on two counts. First, he claimed that Russians were being threatened by Ukrainian extremists and that their lives were in danger. There is no shred of evidence of such a threat. Quite to the contrary, Ukraine’s Russians have repeatedly stated that they do not need Putin’s protection. Indeed, even Putin’s own Human Rights Council concluded on March 2 that there “were no victims and wounded among the civilian population and soldiers” of Crimea. Perhaps because the grounds for an intervention were preposterous, Russia then argued on March 3 that it intervened because Viktor Yanukovich, Ukraine’s former president, requested that it do so. Russia continues to recognize Yanukovich, even though he lost all his legitimacy in the course of four years of mercilessly exploiting Ukraine and its population (the Ukrainian Treasury is empty, and the country is bankrupt, thanks to Yanukovich), committed crimes against humanity during the mass violence against the demonstrators in Kiev (almost 100 civilians were killed) and abandoned his office when he fled the country.